Tackle those hard-to-reach branches with ease. 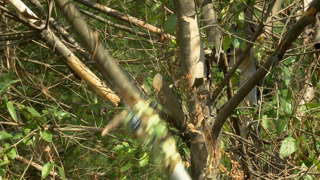 The Sun Joe® SWJ803E electric pole chain saw takes the danger and difficulty out of trimming your overgrown trees. SAW WHAT YOU SEE! Tackle those hard-to-reach branches with ease. The Sun Joe&reg; SWJ803E electric pole chain saw takes the danger and difficulty out of trimming your overgrown trees. Stand safely on solid ground and simply adjust SWJ803E’s telescoping pole to gain up to 14 feet of overhead reach. Powered by a robust 8-amp motor, the SWJ803E’s multi-angle head can handle the most stubborn tree limbs up to 9.5-inches thick. It features a durable, 10-inch Oregon bar and chain with an auto-oiler to keep the bar and chain fully lubricated during use. Unlike gas-powered tools, SWJ803E is powered electrically, so you’ll reliably power up with the push of a button without having to deal with smoke, fumes, unpredictable starters or costly tune-ups. Plus the SWJ803E comes equipped with a built-in safety switch to prevent accidental starting. The Sun Joe&reg; SWJ803E electric pole chain saw carries a full two-year warranty. SAW WHAT YOU SEE! Tackle those hard-to-reach branches with ease. The Sun Joe® SWJ803E electric pole chain saw takes the danger and difficulty out of trimming your overgrown trees. Stand safely on solid ground and simply adjust SWJ803E’s telescoping pole to gain up to 14 feet of overhead reach. Powered by a robust 8-amp motor, the SWJ803E’s multi-angle head can handle the most stubborn tree limbs up to 9.5-inches thick. It features a durable, 10-inch Oregon bar and chain with an auto-oiler to keep the bar and chain fully lubricated during use. Unlike gas-powered tools, SWJ803E is powered electrically, so you’ll reliably power up with the push of a button without having to deal with smoke, fumes, unpredictable starters or costly tune-ups. Plus the SWJ803E comes equipped with a built-in safety switch to prevent accidental starting. The Sun Joe® SWJ803E electric pole chain saw carries a full two-year warranty. This is a well made device with excellent attention to fit and detail. It was assembled easily with the instructions provided and worked as soon as I plugged it in and activated the safety trigger. Since then I have been able to trim both my crape myrtles and a bald cypress lower canopy with amazing ease. It collapses nicely for efficient storage. On top of that the package included the pole saw, all parts, a tool and sufficient bar oil to fill the reservoir. I am very happy with this product and would recommend it to anyone capable of following simple instructions. I have a very large oak which has branches stretching 40ft, covering roof. I have had to maintain the canopy with manual pole saws and loppers. I did rent occasionally a gas pole saw, but the cost and return was a bother. This unit allowed me to trim this tree and clear far more from under the canopy than I had expected. It cut through 4 to 6 inch branches so easily. This has proven to be one of the best investments in protecting both the tree and my home. I live on a cedar and fir tree covered island property so I own an assortment of serious chainsaws. This is just the pruning tool I have needed for years and the tilting head is a bonus for overhead branches. Now I am considering adding your hedge trimmer to my arsenal to topiary my young cedars into hedges. I purchased this electric pole chain saw approx. 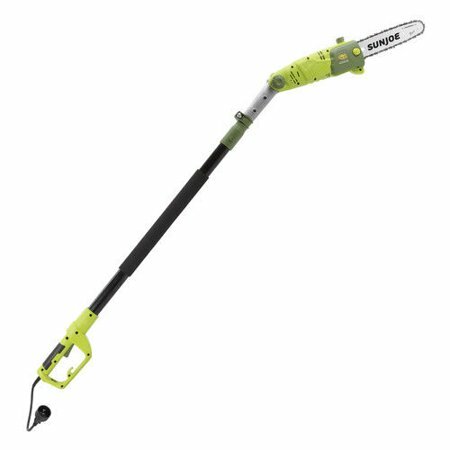 2 months ago.I have used it once to trim off some low hanging tree branches.It does a very good job.It is fairly easy to handle.The option to extend the pole to various lengths is very handy.Overall appears to be a very good product. One of my fears was that the Chain saw was going to be too difficult to manage on my own but I was pleasantly surprised tat even this 63 year old woman could manage and that yes the cutting went smoothly and without a hitch. It is of course heavy but you do not need to be Gonzilla to lift the pole and in the end it cuts branches much more efficiently then a hand held one especially one you are tryig to manage while balancing on a ladder.